The Creekside Restaurant is contemporary in design with a modern look and feel. 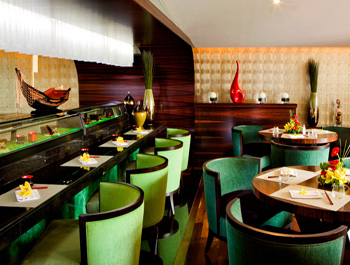 The restaurant separates into various areas to host a variety of dining experiences. With speckled marble Teppanyaki tables, round tables and terrace sofa seating our diners are presented with a variety of options to suit any occasion. Southeast Asian Kitchen is inspired by the traditional shop-houses found throughout Thailand, Malaysia, and Vietnam. The Shop-House menu pairs the bold and complex flavors of Southeast Asia with fresh, sustainable raised ingredients; meats, fish, seafood, a variety of fresh vegetables, aromatic herbs, spicy sauces, and an array of garnishes. You choose from the sea food buffet line and customize your meal according to flavor preference and diet.